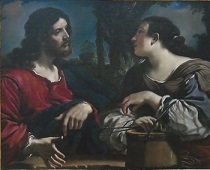 Woman and Christ at the well by Guercino, image is not for reproduction. Hawthorne, Nathaniel, A Wonder Book, “the Miraculous Pitcher”, published by A. L. Burt Company, New York, pg. 214-219. Since the part of the country where he grew up was so sparsely populated his hometown held the important distinction of being the state’s second largest city even with its relatively small population. Nestled in a valley of the Rocky Mountains the city was just the right size for a young boy (after he had grown a little older) to walk or ride his bike through nearly every street and neighborhood. Even while he was small and depended on others to take him places he could still have adventures. Of course the city’s small downtown area had no tinsel and glamour of large city life with its daily inhabitants of tall skyscrapers and night-time flood of neon lights. It did have lofty hillsides and majestic mountains, though, to take their place. Then, too, Main Street on the edge of downtown had a place that in its own special way made up for the small city’s insignificant hustle and bustle. It was an old fashioned Dairy Queen located in the first floor of a two story building right on the intersection. The entrance had a large vestibule area and a sliding window where they took orders. A large round column filled the corner of the open area by the intersection. One of the greatest times he had was going there with his family and friends for a nickle ice cream cone. A few blocks farther down the street the Coca Cola Bottling Company constructed a building with a large room that also had big picture windows. Indeed, two sides of the showcased room were all picture windows. These windows opened up the rebottling plant and its machines into the view of passers-by. Many people of the small city came there, like this one family of the young boy, and stood up close to watch and clearly see how the reused (but sterilized) bottles made their way in close succession around the mechanical conveyor track. There they were refilled quickly one by one, capped, and packaged, all in a way that was intriguing for a little boy to watch. On the way back home from there. (Still on Main Street) there was another noticeable, but disturbing, building with a picture window. That is, it was disturbing to a young boy not used to that kind of novelty in architecture. The window frame was built in a way so that it had a steep slope —not outward, but inward into the building. At the bottom of the picture window was a flower bed with its outer side being part of the front wall. This appearance gave him an uncomfortable feeling. As he grew older he could sometimes go downtown on his own. Near the center of downtown there was a Woolworth’s five and dime store that had a long counter where he could buy a frozen mug filled to overflowing with root beer —all for just a nickel. Then as he grew even older and earned his own money he could buy himself a Rocky Road ice cream cone at the Hallowell Drug store on the opposite side of downtown. The drug store was across the street from the only post office. The multi-storied stone building also housed federal offices and even had an elevator. Only the downtown’s plush Bannock Hotel could also boast of having one of those. Then too, amidst his growing up years, this modern age of increasing innovation and invention, with its inherent risks, would hold most-certain danger for a young boy. A traffic engineer’s application of a new invention for public safety brought about a regulation whereby the young boy simply could not fathom its purpose. There, while the old familiar traffic light was showing its green signal to proceed, the new traffic signal for pedestrians lighted up with the warning “Don’t Walk.” This contradiction of signals confused him. He knew that he was supposed to follow the sign for pedestrians but the contradiction, lack of understanding, and longer wait made it difficult. One time, in a hurry and deciding to disregard what he couldn’t understand, the young boy ignored the traffic signal’s confusing new set of rules and ran out into the street to take his chance on beating the red light. Into the heavy traffic of that hour of the day he ran and was struck by a car because the driver couldn’t see that the running boy was quickly headed directly in his way. The responsible driver immediately got out of his car and came to the young boy’s aid. The boy then stood up, pretty much on his own, and, resisting the unwanted attention, kept insisting, “I’m okay.” Meanwhile, someone else in one of the businesses nearby had called in a report to the police. Together the driver and the policeman made sure he was indeed okay. The concerned policeman brought him into the police car and gave him a minimal sort of examination, lightly probing just the most general areas where an injury could occur. Afterwards the driver of the car who collided with the young boy kindly asked, “Can I give you a ride home.” This allowed him to have the opportunity to speak with the boy’s parents if he felt, after seeing his home and knowing the condition of his family, it would be necessary. His home was only a few blocks away and the relieved driver did something unusual by abruptly finishing what he set out to do. He dropped off the little boy to go inside of the old house with the dirt yard all alone. The Christmas story for the young boy of our introduction begins with a neighboring family and a member of that family, the friend of this young boy’s oldest brother. Their house was one of the city’s few luxurious homes, especially on the inside, and was nestled in the neighborhood among homes of a variety of conditions, as only would happen in a small city. The large brick home had the luxury of a specially constructed room, set aside exclusively for a fully designed and elaborately constructed train set. Entering through the back door, as children would naturally do, the home’s main floor, off from the kitchen, had an activity room with a cable TV and a better selection of channels to watch Saturday morning cartoon shows on than what the young boy was used to watching. These were about the only rooms the young boy saw in the home of the wealthy family who, like many other rich families of the city, were hospitable and generous to other, poor families. The parents owned an iron salvage warehouse that also had a store in the front where they sold Native American deer hide leather goods and colorfully beaded attire and, in turn, bought deer hides and other animal skins and furs from hunters and trappers. This industry provided the profits that resulted in their having a wonderfully nice home and notoriety in the community. The young boy thought it was unusual that his brother should gain the friendship of one from such a family, but, then again there were other times that his brother surprised him. One of those other times was when his oldest brother was in the third grade and the young boy was not yet in school. It was then that the older brother brought the young boy with him to his classroom at the elementary school to participate in his class party. This opened up the opportunity for an entirely new type of adventure for the young boy who received this most unusual invitation from his brother. At some point in time the older brother received a beneficent gift from his friend who lived in the luxurious home. The youthful son of the rich parents of that family at one time happened to give one of his coats to his friend, the young boy’s older brother. It was a beautiful coat of fleece-like material with various and bright colors. Later on his brother, after he had outgrown it, handed down the coat to this young boy. Somehow, at some point in time, the young boy discovered how he could pick up a stack of papers from the nearby journal office and sell them on the street corners downtown. The young boy would take a stack of papers and after an hour or two would return to the journal office with the change from selling his papers. He turned in the papers that were left over and paid back the newspaper office a nickel for every paper he sold at the price of a dime. That was how he bought the Rocky Road ice cream cones at the Hallowell Drug store. As winter-time progressed and Christmas-time grew near the young boy thought of using his earnings to buy Christmas presents for his family. It was also at this time that he came to notice an alarming mystery, of course, concerning his earnings. Throughout the span of several days time he would carry the standard amount of papers to sell. As he sold the papers he would keep from spending any of the change along the way as he sometimes did. By not spending his money for small things he could save up for Christmas. Yet still when he returned to the newspaper office for some unknown reason he would only have about enough change to pay what he owed and very little to keep for himself and save for Christmas. There was no explanation he could think of. Just about when he was out of time the explanation came to him along with all the lost change. As he was walking on his way back to the journal office his finger protruded through a small hole in the pocket of his coat. He pulled the coat off and discovered his lost coins in the coat’s lining where they had sifted through that small hole. He held the money in his hand and hurried to the Bonanza 88 Cent store on Center Street. For two dollars and some cents amounting to an increment of eighty eight cents he bought a pretty nice jewelry box for his oldest sister. Giving that gift was one of the best events of that Christmas so long ago. In just such a way, Christmas is a time of Joy, rooted in the wondrous giving of a blessed Father who gave his Only Begotten Son. He is the most precious gift that brings the greatest joy and restores the soul and spirit to life. Once I was lost, and went astray. Christ brought me joy and reconciled me to his Father. Ovid tells the story of an aged and pious couple of that region, Philemon and Baucis by name, who entertained Jupiter and Mercury (the Roman equivalents of Zeus and Hermes) unawares, and were rewarded for their hospitality (Metamorphoses viii. 626ff.). But in more recent times the evidence of epigraphy has effectively supplemented that of classical legend. Of two inscriptions from Sedasa, Near Lystra, dating from the middle of the third century, and discovered by Professor W. M. Calder, one records the dedication to Zeus of a statue of Hermes by men with Lycaonian names; the other mentions “priests of Zeus”. Another indication of the joint worship of Zeus and Hermes in those parts is provided by a stone altar discovered near Lystra by Professor Calder and Professor W. H. Buckler in 1926, dedicated to the “Hearer of Prayer” (presumably Zeus) and Hermes. Zeus was the chief god in the Greek pantheon; Hermes, son of Zeus by Maia, was the herald of the gods. Barnabas may have been identified with Zeus because of his more dignified bearing; Paul, the more animated of the two, was called Hermes “because he was the chief speaker” –a very similar expression is used of Hermes by the early forth-century Neoplatonist writer Lamblichus when describing the Egyptian mysteries. When there was assault made both of the Gentiles and also of the Jews with their rulers, to put them to shame and to stone them, they were aware of it, and fled unto Lystra and Derbe, cities of Lycaonia, and unto the region that lies round about, and there preached the gospel. And there sat a certain man at Lystra weak in his feet, being cripple from his mother’s womb, and never walked. The same heard Paul preach. Which beheld him and perceived that he had faith to be whole, and said with a loud voice: stand upright on thy feet. And he started up, and walked. And when the people saw what Paul had done, they lifted up their voices, saying in the speech of Lycaonia: gods are come down to us in the likeness of men. And they called Barnabas Jupiter, and Paul Mercury, because he was the preacher. Then Jupiter’s priest, which dwelt before their city, brought oxen and garlands unto the church porch, and would have done sacrifice with the people. But when the apostles, Barnabas and Paul heard that, they rent their clothes, and ran in among the people, crying and saying: sirs, why do you this? We are mortal men like unto you, and preach unto you, that you should turn from these vanities unto the living God, which made heaven and earth and the sea and all that in them is: the which in times past suffered all nations to walk in their own ways. Nevertheless he left not himself without witness, in that he showed his benefits, in giving us rain from heaven and fruitful seasons, filling our hearts with food and gladness. And with these sayings, scarce refrained they the people, that they had not done sacrifice unto them. What is guilt? A stain upon the soul. And it is a point of vast interest whether the soul may contract such stains, in all their depth and flagrancy, from deeds which may have been plotted and resolved upon, but which, physically, have never had existence. Must the fleshly hand and visible frame of man set its seal to the evil designs of the soul, in order to give them their entire validity against the sinner? Or, while none but crimes perpetrated are cognizable before an earthly tribunal, will guilty thoughts—of which guilty deeds are no more than shadows—will these draw down the full weight of a condemning sentence in the supreme court of eternity? In the solitude of a midnight chamber, or in a desert afar from men, or in a church, while the body is kneeling the soul may pollute itself even with those crimes which we are accustomed to deem altogether carnal. If this be true, it is a fearful truth. Let us illustrate the subject by an imaginary example. A venerable gentleman, one Mr. Smith, who had long been regarded as a pattern of moral excellence, was warming his aged blood with a glass or two of generous wine. His children being gone forth about their worldly business, and his grandchildren at school, he sat alone in a deep, luxurious arm-chair, with his feet beneath a richly-carved mahogany table. Some old people have a dread of solitude, and when better company may not be had, rejoice even to hear the quiet breathing of a babe asleep upon the carpet. But Mr. Smith, whose silver hair was the bright symbol of a life unstained, except by such spots as are inseparable from human nature, he had no need of a babe to protect him by its purity, nor of a grown person, to stand between him and his own soul. Nevertheless, either Manhood must converse with Age, or Womanhood must soothe him with gentle cares, or Infancy must sport around his chair, or his thoughts will stray into the misty region of the past, and the old man be chill and sad. Wine will not always cheer him. Such might have been the case with Mr. Smith, when, through the brilliant medium of his glass of old Madeira, he beheld three figures entering the room. These were Fancy, who had assumed the garb and aspect of an itinerant showman, with a box of pictures on her back; and Memory, in the likeness of a clerk, with a pen behind here ear, an inkhorn at her buttonhole, and a huge manuscript volume beneath her arm; and lastly, behind the other two, a person shrouded in a dusky mantle, which concealed both face and form. But Mr. Smith had a shrewd idea that it was Conscience. How kind of Fancy, Memory, and Conscience to visit the old gentleman, just as he was beginning to imagine that the wine had neither so bright a sparkle, nor so excellent a flavor, as when himself and the liquor were less aged! Through the dim length of the apartment, where crimson curtains muffled the glare of sunshine, and created a rich obscurity, the three guests drew near the silver-haired old man. Memory, with a finger between the leaves of her huge volume, placed herself at his right hand. Conscience, with her face still hidden in the dusky mantle, took her station on the left, so as to be next his heart; while Fancy set down her picture-box upon the table, with the magnifying glass convenient to his eye. We can sketch merely the outlines of two or three out of the many pictures, which, at the pulling of a string, successively peopled the box with the semblances of living scenes. One was a moonlight picture; in the background, a lowly dwelling; and in front, partly shadowed by a tree, yet besprinkled with flakes of radiance, two youthful figures, male and female. The young man stood with folded arms, a haughty smile upon his lip and a gleam of triumph in his eye, as he glanced downward at the kneeling girl. She was almost prostrate at his feet, evidently sinking under a weight of shame and anguish, which hardly allowed her to lift her clasped hands in supplication. Her eyes she could not lift. But neither her agony nor the lovely features on which it was depicted, nor the slender grace of the form which it convulsed, appeared to soften the obduracy of the young man. He was the personification of triumphant scorn. Now, strange to say, as old Mr. Smith peeped through the magnifying glass, which made the objects start out from the canvas with magical deception, he began to recognize the farmhouse, the tree, and both the figures of the picture. The young man, in times, long past, had often met his gaze within the looking-glass; the girl was the very image of his first love,—his cottage love,—his Martha Burroughs! Mr. Smith was scandalized. “O, vile and slanderous picture!” he exclaims. “When have I triumphed over ruined innocence? Was not Martha wedded, in her teens, to David Tomkins, who won her girlish love and long enjoyed her affection as a wife? And ever since his death she has lived a reputable widow!” Meantime, Memory was turning over the leaves of her volume, rustling them to and fro with uncertain fingers, until, among the earlier pages, she found one which had reference to this picture. She reads it, close to the old gentleman’s ear; it is a record merely of sinful thought, which never was embodied in an act; but, while Memory is reading Conscience unveils her face, and strikes a dagger to the heart of Mr. Smith. Though not a death-blow, the torture was extreme. The exhibition proceeded. One after another, Fancy displayed her pictures, all of which appeared to have been painted by some malicious artist, on purpose to vex Mr. Smith. Not a shadow of proof could have been adduced, in any earthly court, that he was guilty of the slightest of those sins which were thus made to stare him in the face. In one scene there was a table set out, with several bottles, and glasses half filled with wine, which threw back the dull ray of an expiring lamp. There had been mirth and revelry, until the hand of the clock stood just at midnight, when murder stepped between the boon companions. A young man had fallen on the floor, and lay stone dead, with a ghastly wound crushed into his temple, while over him, with a delirium of mingled rage and horror in his countenance, stood the youthful likeness of Mr. Smith. The murdered youth wore the features of Edward Spencer! “What does this rascal of a painter mean?” cries Mr. Smith, provoked beyond all patience. “Edward Spencer was my earliest and dearest friend, true to me as I to him, through more than half a century. Neither I, nor any other, ever murdered him. Was he not alive within five years, and did he not, in token of our long friendship, bequeath me his gold-headed cane, and a mourning ring?” Again had Memory been turning over her volume, and fixed at length upon so confused a page, that she surely must have scribbled it when she was tipsy. The purport was, however, that, while Mr. Smith and Edward Spencer were heating their young blood with wine, a quarrel had flashed up between them, and Mr. Smith, in deadly wrath, had flung a bottle at Spencer’s head. True, it missed its aim, and merely smashed a looking-glass; and the next morning when the incident was imperfectly remembered, they had shaken hands with a hearty laugh. Yet, again, while Memory was reading, Conscience unveiled her face, struck a dagger to the heart of Mr. Smith, and quelled his remonstrance with her iron frown. The pain was quite excruciating. Some of the pictures had been painted with so doubtful a touch, and in colors so faint and pale, that the subjects could barely be conjectured. A dull, semi-transparent mist had been thrown over the surface of the canvas, into which the figures seemed to vanish, while the eye sought most earnestly to fix them. But, in every scene, however dubiously portrayed, Mr. Smith was invariably haunted by his own lineaments, at various ages, as in a dusty mirror. After poring several minutes over one of these blurred and almost indistinguishable pictures, he began to see that the painter had intended to represent him, now in the decline of life, as stripping the clothes from the backs of three half-starved children. “Really, this puzzles me!” quoth Mr. Smith, with the irony of conscious rectitude. “Asking pardon of the painter, I pronounce him a fool, as well as a scandalous knave. A man of my standing in the world, to be robbing little children of their clothes! Ridiculous!” But while he spoke, Memory had searched her fatal volume, and found a page, which, with her sad, calm voice, she poured into his ear. It was not altogether inapplicable to the misty scene. It told how Mr. Smith had been grievously tempted by many devilish sophistries, on the ground of a legal quibble, to commence a lawsuit against three orphan children, joint heirs to a considerable estate. Fortunately, before he was quite decided, his claims had turned out nearly as devoid of law as justice. As Memory ceased to read. Conscience again thrust aside her mantle, and would have struck her victim with the envenomed dagger, only that he struggled, and clasped his hands before his heart. Even then, however, he sustained an ugly gash. Why should we follow Fancy through the whole series of those awful pictures? Painted by an artist of wondrous power, and terrible acquaintance with the secret soul, they embodied the ghosts of all the never perpetrated sins that had glided through the lifetime of Mr. Smith. And could such beings of cloudy fantasy, so near akin to nothingness, give valid evidence against him, at the day of judgment? Be that the case or not, there is reason to believe that one truly penitential tear would have washed away each hateful picture, and left the canvas white as snow. But Mr. Smith, at a prick of Conscience too keen to be endured, bellowed aloud, with impatient agony, and suddenly discovered that his tree guests were gone. There he sat alone, a silver-haired and highly venerated old man, in the rich gloom of the crimson-curtained room, with no box of pictures on the table, but only a decanter of most excellent Madeira. Yet his heart still seemed to fester with the venom of the dagger. Nevertheless, the unfortunate old gentleman might have argued the matter with Conscience, and alleged many reasons wherefore she should not smite him so pitilessly. Were we to take up his cause, it should be somewhat in the following fashion: A scheme of guilt, till it be put in execution, greatly resembles a train of incidents in a projected tale. The latter, in order to produce a sense of reality in the reader’s mind, must be conceived with such proportionate strength by the author as to seem, in the glow of fancy, more like truth past, present, or to come, than purely fiction. The prospective sinner, on the other hand, waves his plot of crime, but seldom or never feels a perfect certainty that it will be executed. There is a dreaminess diffused about his thoughts; in a dream, as it were, he strikes the death-blow into his victim’s heart, and starts to find an indelible bloodstain on his hand. Thus a novel-writer, or a dramatist, in creating a villain of romance, and fitting him with evil deeds, and the villain of actual life, in projecting crimes that will be perpetrated, may almost meet each other, half-way between reality and fancy. It is not until the crime is accomplished, that guilt clinches its gripe upon the guilty heart, and claims it for its own. Then, and not before, sin is actually felt and acknowledged, and, if unaccompanied by repentance, grows a thousand-fold more virulent by its self-consciousness. Be it considered, also, that men often over-estimate their capacity for evil. At a distance, while its attendant circumstances do not press upon their notice, and its results are dimly seen, they can bear to contemplate it. They may take the steps which lead to crime, impelled by the same sort of mental action as in working out a mathematical problem, yet be powerless with compunction at the final moment. They knew not what deed it was that they deemed themselves resolved to do. In truth, there is no such thing in man’s nature as a steeled and full resolve, either for good or evil, except at the very moment of execution. Let us hope, therefore, that all the dreadful consequences of sin will not be incurred, unless the act have set its seal upon the thought. Yet, with the slight fancy work which we have framed, some sad and awful truths are interwoven. Man must not disclaim his brotherhood, even with the guiltiest, since, though his hand be clean, his heart has surely been polluted by the flitting phantoms of iniquity. He must feel, that, when he shall knock at the gate of Heaven, no semblance of an unspotted life can entitle him to entrance there. Penitence must kneel, and Mercy come from the footstool of the throne, or that golden gate will never open! And when and where do you think we find the children next? No longer in the wintertime, but in the merry month of May. No longer in Tanglewood playroom or at Tanglewood fireside, but more than halfway up a monstrous hill, or a mountain, as perhaps it would be better pleased to have us call it. They had set out from home with the mighty purpose of climbing this high hill even to the very tiptop of its bald head. To be sure, it was not quite so high as Chimbarozo or Mont Blanc, and was even a good deal lower than old Graylock. But, at any rate, it was higher than a thousand ant-hillocks or a million of molehills, and when measured by the short strides of little children might be reckoned a very respectable mountain. And was Cousin Eustace with the party? Of that you may be certain, else how could the book go on a step further? He was now in the middle of the spring vacation and looked pretty much as we saw him four or five months ago, except that if you gazed quite closely at his upper lip you could discern the funniest little bit of a mustache upon it. Setting aside this mark of mature manhood, you might have considered Cousin Eustace just as much a boy as when you first became acquainted with him. He was as merry, as playful, as good-humored, as light of foot and of spirits, and equally a favorite with the little folks as he had always been. This expedition up the mountain was entirely of his contrivance. All the way up the steep ascent he had encouraged the elder children with his cheerful voice, and when Dandelion, Cowslip, and Squash-blossom grew weary he had lugged them along, alternately, on his back. In this manner they had passed through the orchards and pastures on the lower part of the hill, and had reached the wood which extends thence toward its bare summit. The month of May thus far had been more amiable than it often is, and this was as sweet and genial a day as the heart of man or child could wish. In their progress up the hill the small people had found enough of violets, blue and white, and some that were as golden as if they had the touch of Midas on them. That sociablest of flowers, the little Housatonia, was very abundant. It is a flower that never lives alone, but which loves its own kind, and is always fond of dwelling with a great many friends and relatives around it. Sometimes you see a family of them covering a space no bigger than the palm of your hand, and sometimes a large community whitening a whole tract of pasture and all keeping one another in cheerful heart and life. Within the verge of the wood there were columbines, looking more pale than red, be cause they were so modest, and had thought proper to seclude themselves too anxiously from the sun. There were wild geraniums, too, and a thousand white blossoms of the strawberry. The trailing arbutus was not yet quite out of bloom, but it hid its precious flowers under the last year’s withered forest leaves as carefully as a mother-bird hides its little young ones. It knew, I suppose, how beautiful and sweet-scented they were. So cunning was their concealment that the children sometimes smelled the delicate richness of their perfume before they knew whence it proceeded. Amid so much new life it was strange and truly pitiful to behold here and there, in the fields and pastures, the hoary periwigs of dandelions that had already gone to seed. They had done with summer before the summer came. Within those small globes of winged seeds it was autumn now. Well, but we must not waste our valuable pages with any more talk about the springtime and wild flowers. There is something, we hope, more interesting to be talked about. If you look at the group of children, you may see them all gathered around Eustace Bright, who, sitting on the stump of a tree, seems to be just beginning a story. The fact is, the younger part of the troop have found out that it takes rather too many of their short strides to measure the long ascent of the hill. Cousin Eustace, therefore, has decided to leave Sweet Fern, Cowslip, Squash-blossom, and Dandelion at this point, midway up, until the return of the rest of the party from the summit. And because they complain a little and do not quite like to stay behind, he gives them some apples out of his pocket and proposes to tell them a very pretty story. Hereupon they brighten up and change their grieved looks into the broadest kind of smiles. As for the story, I was there to hear it, hidden behind a bush, and shall tell it over to you in the pages that come next. One evening in times long ago old Philemon and his old wife Baucis sat at their cottage door enjoying the calm and beautiful sunset. They had already eaten their frugal supper, and intended now to spend a quiet hour or two before bedtime. So they talked about their garden and their cow and their bees and their grapevine which clambered over the cottage wall, and on which the grapes were beginning to turn purple. But the rude shouts of children and the fierce barking of dogs in the village near at hand grew louder and louder, until at last it was hardly possible for Baucis and Philemon to hear each other speak. These old folks, you must know, were quite poor, and had to work pretty hard for a living. Old Philemon toiled diligently in his garden, while Baucis was always busy with her distaff, or making a little butter and cheese with their cow’s milk, or doing one thing and another about the cottage. Their food was seldom anything but bread, milk, and vegetables, with sometimes a portion of honey from their beehive, and now and then a bunch of grapes that had ripened against the cottage wall. But they were two of the kindest old people in the world, and would cheerfully have gone without their dinners any day rather than refuse a slice of their brown loaf, a cup of new milk, and a spoonful of honey to the weary traveler who might pause before their door. They felt as if such guests had a sort of holiness, and that they ought, therefore, to treat them better and more bountifully than their own selves. Their cottage stood on a rising ground at some short distance from a village which lay in a hollow valley that was about half a mile in breadth. This valley in past ages, when the world was new, had probably been the bed of a lake. There fishes had glided to and fro in the depths, and water weeds had grown along the margin, and trees and hills had seen their reflected images in the broad and peaceful mirror. But as the waters subsided, men had cultivated the soil and built houses on it, so that it was now a fertile spot, and bore no traces of the ancient lake except a very small brook which meandered through the midst of the village and supplied the inhabitants with water. The valley had been dry land so long that oaks had sprung up and grown great and high, and perished with old age, and been succeeded by others as tall and stately as the first. Never was there a prettier or more fruitful valley. The very sight of the plenty around them should have made the inhabitants kind and gentle and ready to show their gratitude to Providence by doing good to their fellow-creatures. But, we are sorry to say, the people of this lovely village were not worthy to dwell in a spot on which Heaven had smiled so beneficently. They were a very selfish and hard-hearted people, and had no pity for the poor nor sympathy with the homeless. They would only have laughed had anybody told them that human beings owe a debt of love to one another, because there is no other method of paying the debt of love and care which all of us owe to Providence. You will hardly believe what I am going to tell you. These naughty people taught their children to be no better than themselves, and used to clap their hands by way of encouragement when they saw the little boys and girls run after some poor stranger, shouting at his heels and pelting him with stones. They kept large and fierce dogs, and whenever a traveler ventured to show himself in the village street this pack of disagreeable curs scampered to meet him, barking, snarling, and showing their teeth. Then they would seize him by the leg or by the clothes, just as it happened, and, if he were ragged when he came, he was generally a pitiable object before he had time to run away. This was a very terrible thing to poor travelers, as you may suppose, especially when they chanced to be sick or feeble or lame or old. Such persons (if they once knew how badly these unkind people and their unkind children and curs were in the habit of behaving) would go miles and miles out of their way rather than try to pass through the village again. What made the matter seem worse, if possible, was that when rich persons came in their chariots or riding on beautiful horses, with their servants in rich liveries attending on them, nobody could be more civil and obsequious than the inhabitants of the village. They would take off their hats and make the humblest bows you ever saw. If the children were rude, they were pretty certain to get their ears boxed; and as for the dogs, if a single cur in the pack presumed to yelp, his master instantly beat him with a club and tied him up without any supper. This would have been all very well, only it proved that the villagers cared much about the money that a stranger had in his pocket, and nothing whatever for the human soul which lives equally in the beggar and the prince. So now you can understand why old Philemon spoke so sorrowfully when he heard the shouts of the children and the barking of the dogs at the further extremity of the village street. There was a confused din, which lasted a good while and seemed to pass quite through the breadth of the valley. “I never heard the dogs so loud,” observed the good old man. “Nor the children so rude,” answered his good old wife. They sat shaking their heads one to another while the noise came nearer and nearer, until, at the foot of the little eminence on which their cottage stood, they saw two travelers approaching on foot. Close behind them came the fierce dogs snarling at their very heels. A little further off ran a crowd of children, who sent up shrill cries and flung stones at the two strangers with all their might. Once or twice the younger of the two men (he was a slender and very active figure) turned about and drove back the dogs with a staff which he carried in his hand. His companion, who was a very tall person, walked calmly along, as if disdaining to notice either the naughty children or the pack of curs whose manners the children seemed to imitate. Both of the travelers were very humbly clad, and looked as if they might not have money enough in their pockets to pay for a night’s lodging. And this, I am afraid, was the reason why the villages had allowed their children and dogs to treat them so rudely. Philemon was glad to see him in such good spirits; nor, indeed, would you have fancied, by the traveler’s look and manner, that he was weary with a long day’s journey, beside being disheartened by rough treatment at the end of it. He was dressed in rather an odd way, with a sort of cap on his head, the brim of which stuck out over both ears. Though it was a summer evening he wore a cloak, which he kept wrapped closely about him, perhaps because his undergarments were shabby. Philemon perceived, too, that he had on a singular pair of shoes, but as it was now growing dusk, and as the old man’s eyesight was none the sharpest, he could not precisely tell in what the strangeness consisted. One thing certainly seemed queer; the traveler was so wonderfully light and active that it appeared as if his feet sometimes rose from the ground of their own accord or could only be kept down by an effort. The staff, in fact, was the oddest-looking staff that Philemon had ever beheld. It was made of olive wood, and had something like a little pair of wings near the top. Two snakes carved in the wood were represented as twining themselves about the staff, and were so very skillfully executed that old Philemon (whose eyes you know, were getting rather dim) almost thought them alive, and that he could see them wriggling and twisting. By this time Philemon and his two guests had reached the cottage door. The younger stranger threw himself carelessly on the bench, letting his staff fall as he did so. And here happened something rather marvelous, though trifling enough too. The staff seemed to get up from the ground of its own accord, and, spreading its little pair of wings, it half hopped, half flew, and leaned itself against the wall of the cottage. There it stood quite still, except that the snakes continued to wriggle. But, in my private opinion old Philemon’s eyesight had been playing him tricks again. Before he could ask any questions the elder stranger drew his attention from the wonderful staff by speaking to him. The traveler looked so stern that Philemon was really almost frightened; the more so, that at his frown the twilight seemed suddenly to grow darker, and that when he shook his head there was a loud roll as of thunder in the air. But in a moment afterward the stranger’s face became so kindly and mild that the old man quite forgot his terror. Nevertheless, he could not help feeling that this elder traveler must be no ordinary personage, although he happened now to be attired so humbly and to be journeying on foot. Not that Philemon fancied him a prince in disguise or any character of that sort, but rather some exceedingly wise man who went about the world in this poor garb, despising wealth and all worldly objects, and seeking everywhere to add a mite to his wisdom. This idea appeared the more probable because, when Philemon raised his eyes to the stranger’s face, he seemed to see more thought there in one look that he could have studied out in a lifetime. While Baucis was getting the supper the travelers both began to talk very sociably with Philemon. The younger, indeed, was extremely loquacious, and made such shrewd and witty remarks that the good old man continually burst out a-laughing, and pronounced him the merriest fellow whom he had seen for many a day. This remark, whether it were serious or in jest, might have caused Philemon to conceive a very great awe of the elder stranger if, on venturing to gaze at him, he had not beheld so much beneficence in his visage. But, undoubtedly, here was the grandest figure that ever sat so humbly beside a cottage door. When the stranger conversed, it was with gravity, and in such a way that Philemon felt irresistibly moved to tell him everything which he had most at heart. This is always the feeling that people have when they meet with anyone wise enough to comprehend all their good and evil and to despise not a tittle of it. But Philemon, simple and kind-hearted old man that he was, had not many secrets to disclose. He talked, however, quite garrulously about the events of his past life, in the whole course of which he had never been a score of miles from this very spot. His wife Baucis and himself had dwelt in the cottage from their youth upward, earning their bread by honest labor, always poor, but still contented. He told what excellent butter and cheese Baucis made, and how nice were the vegetables which he raised in his garden. He said, too, that, because they loved one another so very much, it was the wish of both that death might not separate them, but that they should die, as they had lived, together. As the stranger listened a smile beamed over his countenance and made its expression as sweet as it was grand. And it seemed to Philemon just then as if the sunset clouds threw up a bright flash from the west and kindled a sudden light in the sky. Baucis had now got supper ready, and, coming to the door, began to make apologies for the poor fare which she was forced to set before her guests. They all went into the cottage. And now, my little auditors, shall I tell you something that will make you open your eyes very wide. It is really one of the oddest circumstances in the whole story. Quicksilver’s staff, you recollect, had set itself up against the wall of the cottage. Well, when its master entered the door, leaving this wonderful staff behind, what should it do but immediately spread its little wings and go hopping and fluttering up the doorsteps! Tap, tap, went the staff on the kitchen floor, nor did it rest until it had stood itself on end, with the greatest gravity and decorum, beside Quicksilver’s chair. Old Philemon, however, as well as his wife, was so taken up in attending to their guests that no notice was given to what the staff had been about. As Baucis had said, there was but a scanty supper for two hungry travelers. In the middle of the table was the remnant of a brown loaf, with a piece of cheese on one side of it and a dish of honeycomb on the other. There was a pretty good bunch of grapes for each of the guests. A moderately-sized earthen pitcher nearly full of milk stood at a corner of the board, and when Baucis had filled two bowls and set them before the strangers only a little milk remained in the bottom of the pitcher. Alas! it is a very sad business when a bountiful heart finds itself pinched and squeezed among narrow circumstances. Poor Baucis kept wishing that she might starve for a week to come if it were possible by so doing to provide these hungry folks a more plentiful supper. And, since the supper was so exceedingly small, she could not help wishing that their appetites had not been quite so large. Why, at their very first sitting down the travelers both drank off all the milk in their two bowls at a draught! So saying, and to the vast astonishment of Baucis, he proceeded to fill not only his own bowl, but his companion’s likewise, from the pitcher that was supposed to be almost empty. The good woman could scarcely believe her eyes. She had certainly poured out nearly all the milk, and had peeped in afterward and seen the bottom of the pitcher as she set it down upon the table. Now, Baucis had seen as plainly as she could see anything that Quicksilver had turned the pitcher upside down, and consequently had poured out every drop of milk in filling the last bowl. Of course there could not possibly be any left. However, in order to let him know precisely how the case was, she lifted the pitcher and made a gesture as if pouring milk into Quicksilver’s bowl, but without the remotest idea that any milk would stream forth. What was her surprise, therefore, when such an abundant cascade fell bubbling into the bowl that it was immediately filled to the brim and overflowed upon the table! The two snakes that were twisted about Quicksilver’s staff (but neither Baucis nor Philemon happened to observe this circumstance) stretched out their heads and began to lap up the spilled milk. And then what a delicious fragrance the milk had! It seemed as if Philemon’s only cow must have pastured that day on the richest herbage that could be found anywhere in the world. I only wish that each of you, my beloved little souls, could have a bowl of such nice milk at supper-time! Baucis cut him a slice accordingly; and though the loaf, when she and her husband ate of it, had been rather too dry and crusty to be palatable, it was now as light and moist as if but a few hours out of the oven. Tasting a crumb which had fallen on the table, she found it more delicious than bread ever was before, and could hardly believe that it was a loaf of her own kneading and baking. Yet what other loaf could it possibly be? But oh, the honey! I may just as well let it alone, without trying to describe how exquisitely it smelled and looked. Its color was that of the purest and most transparent gold, and it had the odor of a thousand flowers, but of such flowers as never grew in an earthly garden, and to seek which the bees must have flown high above the clouds. The wonder is, that after alighting on a flower-bed of so delicious fragrance and immortal bloom they should have been content to fly down again to their hive in Philemon’s garden. Never was such honey tasted, seen or smelled. The perfume floated around the kitchen, and made it so delightful that, had you closed your eyes, you would instantly have forgotten the low ceiling and smoky walls, and have fancied yourself in an arbor with celestial honeysuckles creeping over it. Although good mother Baucis was a simple old dame, she could not but think that there was something rather out of the common way in all that had been going on. So, after helping the guests to bread and honey and laying a bunch of grapes by each of their plates, she sat down by Philemon and told him what she had seen in a whisper. “Did you ever hear the like?” asked she. Each of the guests had now taken his bunch of grapes upon his plate Baucis (who rubbed her eyes in order to see the more clearly) was of opinion that the clusters had grown larger and richer, and that each separate grape seemed to be on the point of bursting with ripe juice. It was entirely a mystery to her how such grapes could ever have been produced from the old stunted vine that climbed against the cottage wall. This time old Philemon bestirred himself and took up the pitcher, for he was curious to discover whether there was any reality in the marvels which Baucis had whispered to him. He knew that his good old wife was incapable of falsehood, and that she was seldom mistaken in what she supposed to be true; but this was so very singular a case that he wanted to see into it with his own eyes. On taking up the pitcher, therefore, he slyly peeped into it, and was fully satisfied that it contained not so much as a single drop. All at once, however, he beheld a little white fountain which gushed up from the bottom of the pitcher and speedily filled it to the brim with foaming and deliciously fragrant milk. It was lucky that Philemon, in his surprise, did not drop the miraculous pitcher from his hand. “Who are ye, wonder-working strangers?” cried he, even more bewildered than his wife had been. The supper being now over, the strangers requested to be shown to their place of repose. The old people would gladly have talked with them a little longer, and have expressed the wonder which they felt, and their delight at finding the poor and meager supper prove so much better and more abundant than they hoped. But the elder traveler had inspired them with such reverence that they dared not ask him any questions. And when Philemon drew Quicksilver aside and inquired how under the sun a fountain of milk could have got into an old earthen pitcher, this latter personage pointed to his staff. He said no more, but looked so slyly in their faces that they rather fancied he was laughing at them. The magic staff went hopping at his heels as Quicksilver quitted the room. When left alone the good old couple spent some little time in conversation about the events of the evening, and then lay down on the floor and fell fast asleep. They had given up their sleeping-room to the guests, and had no other bed for themselves save these planks, which I wish had been as soft as their own hearts. The old man and his wife were stirring betimes in the morning, and the strangers likewise arose with the sun and made their preparations to depart. Philemon hospitably entreated them to remain a little longer until Baucis could milk the cow and bake a cake upon the hearth, and perhaps find them a few fresh eggs for breakfast. The guests, however, seemed to think it better to accomplish a good part of their journey before the heat of the day should come on. They therefore persisted in setting out immediately, but asked Philemon and Baucis to walk forth with them a short distance and show them the road which they were to take. So they all four issued from the cottage, chatting together like old friends. It was very remarkable indeed how familiar the old couple insensibly grew with the elder traveler, and how their good and simple spirits melted into his, even as two drops of water would melt into the illimitable ocean. And as for Quicksilver, with his keen, quick, laughing wits, he appeared to discover every little thought that but peeped into their minds before they suspected it themselves. They sometimes wished, it is true, that he had not been quite so quick-witted, and also that he would fling away his staff, which looked so mysteriously mischievous with the snakes always writhing about it. But then, again, Quicksilver showed himself so very good-humored that they would have been rejoiced to keep him in their cottage, staff, snakes, and all, every day and the whole day long. The elder traveler’s brow just then assumed such a grave, stern, and awful grandeur, yet serene withal, that neither Baucis nor Philemon dared to speak a word. They gazed reverently into his face, as if they had been gazing at the sky. Philemon and his wife turned toward the valley where at sunset only the day before they had seen the meadows, the houses, the gardens, the clumps of trees, the wide, green-margined street with children playing in it, and all the tokens of business, enjoyment, and prosperity. But what was their astonishment! There was no longer any appearance of a village! Even the fertile vale in the hollow of which it lay had ceased to have existence. In its stead they beheld the broad blue surface of a lake which filled the great basin of the valley from brim to brim, and reflected the surrounding hills in its bosom with as tranquil an image as if it had been there ever since the creation of the world. For an instant the lake remained perfectly smooth. Then a little breeze sprang up and caused the water to dance, glitter, and sparkle in the early sunbeams and to dash with a pleasant rippling murmur against the hither shore. The lake seemed so strangely familiar that the old couple were greatly perplexed, and felt as if they could only have been dreaming about a village having lain there. But the next moment they remembered the vanished dwellings and the faces and characters of the inhabitants far too distinctly for a dream. The village had been there yesterday, and now was gone! They did so; but what was their surprise on beholding a tall edifice of white marble with a wide-open portal occupying the spot where their humble residence had so lately stood. The old folks fell on their knees to thank him, but, behold! neither he nor Quicksilver was there. So Philemon and Baucis took up their residence in the marble palace and spent their time with vast satisfaction to themselves, in making everybody jolly and comfortable who happened to pass that way. The milk-pitcher, I must not forget to say, retained its marvelous quality of being never empty when it was desirable to have it full. Whenever an honest, good-humored, and free-hearted guest took a draught from this pitcher, he invariably found it the sweetest and most invigorating fluid that ever ran down his throat. But if a cross and disagreeable curmudgeon happened to sip, he was pretty certain to twist his visage into a hard knot and pronounce it a pitcher of sour milk. Thus the old couple lived in their palace a great, great while, and grew older and older, and very old indeed. At length, however, there came a summer morning when Philemon and Baucis failed to make their appearance, as on other mornings, with one hospitable smile overspreading both their pleasant faces, to invite the guests of overnight to breakfast. The guests searched everywhere, from top to bottom of the spacious palace, and all to no purpose. But after a great deal of perplexity they espied in front of the portal two venerable trees which nobody could remember to have seen there the day before. Yet there they stood, with their roots fastened deep into the soil and a huge breadth of foliage overshadowing the whole front of the edifice. One was an oak and the other a linden tree. Their boughs—it was strange and beautiful to see—were intertwined together and embraced one another, so that each tree seemed to live in the other tree’s bosom much more than in its own. While the guests were marveling how these trees, that must have required at least a century to grow, could have come to be so tall and venerable in a single night, a breeze sprang up and set their intermingled boughs astir. And then there was a deep, broad murmur in the air, as if the two mysterious trees were speaking. “I am old Philemon!” murmured the oak. “I am old Baucis!” murmured the linden tree. And some kind soul that knew what would have pleased old Baucis and old Philemon best built a circular seat around both their trunks, where, for a great while afterward, the weary and the hungry, and the thirsty used to repose themselves and quaff milk abundantly out of the miraculous pitcher. And I wish, for all our sakes, that we had the pitcher here now. “How much did the pitcher hold?” asked Sweet Fern. “And what has become of the pitcher now?” inquired the little boy. “What a pity!” cried all the children at once. The respectable dog Ben had accompanied the party, as did likewise a half-grown New foundland puppy who went by the name of Bruin, because he was just as black as a bear. Ben, being elderly and of very circumspect habits, was respectfully requested by Cousin Eustace to stay behind with the four little children, in order to keep them out of mischief. As for black Bruin, who was himself nothing but a child, the student thought it best to take him along, lest in his rude play with the other children he should trip them up and send them rolling and tumbling down the hill. Advising Cowslip, Sweet Fern, Dandelion and Squash-blossom to sit pretty still in the spot where he left them, the student, with Primrose and the elder children, began to ascend, and were soon out of sight among the trees.